The image that (currently) previews in that tweet isn’t the original photo that was posted to this Ars Technica article. Originally, the article featured an image of my three children engaging in a Facetime conversation with my dad. I released this image under a Creative Commons license (BY-NC-SA), one that requires attribution, non-commercial use, and that the license remains the same even if someone adapts the photograph. Below is a screenshot of the original photo placement in the article, and you should notice that attribution is not provided. This seemed particularly ironic as the content of the article deals with intellectual property, and the author writes prolifically on these topics. Shortly after I received the tweet from Rob, I sent the author a tweet and posted a comment on the article. 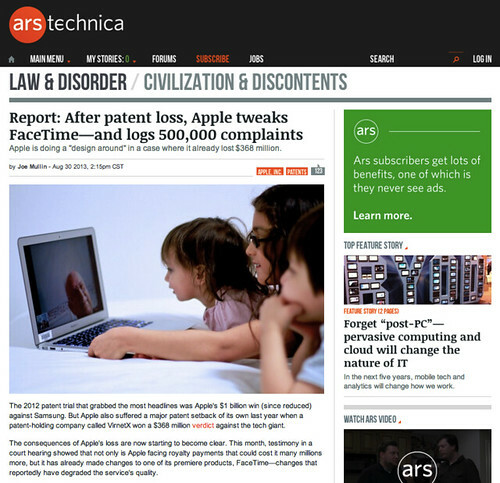 Essentially, I was fine with Ars Technica using the photograph, was happy to provide permission for non-commercial use, but urged Ars to provide proper attribution for the image. While it took several hours for a response (which I think is quite reasonable), I eventually received this tweet from the author, @joemullin. I was pleased with the response. I don’t see this as theft. I recognize that this could easily have been an oversight. And apologizing publicly is not easy for many. So, I respect Joe for that and appreciate the transparency in his response. Shortly after this tweet for Joe, I also received an email from the editor. I have pasted the text of this email below, and respond to it here. Hi, I’m the creative director for Ars. First off, let me apologize for the oversight on your image credit. Our policy is always to credit and link all CC licensed photos, a quick glance at some other stories on our site should show the credit below the image. This was simply a mistake, didn’t mean for you to feel ripped off or cheated in any way. Thanks Aurich. I’m happy with your swift response. Personally, I do not feel ripped off or cheated as I don’t feel a strong sense of ownership for the content that I create. However, the lack of attribution cheats your readership (the general public). While it may not seem like a big deal in the case of this single photograph, I feel that proper attribution is essential in providing others with the origin, adaptions, and travels of an artefact or idea. I love seeing that my work is useful for others. But, without attribution, we silence potential conversations around the matter and the context of ideas/artefacts being shared. Let me also apologize for using an image that must resonate with you emotionally right now, definitely not our intention. I prefer that our writers not use photos of people from Flickr, even when licensed clearly for use, they’re not professional models and it can sometimes come out badly. Better to stick with licensed stock art for that kind of thing when possible. I appreciate that Joe has made this statement publicly. Our policy is to just immediately pull any image if someone claims the rights to it and objects. We don’t even verify they own it, better safe than sorry. So in this case your photo was immediately pulled once your comment was seen. The response was as timely as could be expected on a Saturday. I also want to address the non-commercial license issue, it’s a bit of a mess as far as sorting out what it means. My understanding from lawyers (I’m certainly not one) is that CC licenses under “non commercial” are fair use for editorial purposes, even if the site in question also operates as a for-profit entity (so banner ads etc). Understandably some people might be 100% fine with that, and others might object because it doesn’t meet the spirit of what they thought they were putting up under that license. So Joe wasn’t ignoring your license, he was just doing what he was told is fair game. The NC licensing is clearly tricky. I’ve written about it here. The comments on the post also demonstrate how confusing NC licenses may be. I really mention this though to say that it’s a pretty common industry practice, and if that bothers you then you might want to reconsider what CC license you use for some of your photos. I would hope that everyone would pull a photo down immediately if requested, but you still have to find out they’re using it first. I continue to license all of my content, personal and professional, under Creative Commons licenses. My professional work typically falls under BY/SA licenses. However, I add the NC clause to my personal photos. In doing this, I find that people are more likely then to a) use my works under clearly non-commercial circumstances, b) avoid these works because of the uncertainty, or c) ask permission (as in the case of Nokia in the post I shared). This seems to provide me with a bit more control of the work in my personal domain. If I can help with anything else please let me know, I wanted to reach out to you directly once I was made aware of the issue. We’re grateful for people who share their photos for use, we don’t have a photography staff or art department, and we’d be poorer off without that generosity. Any time there’s any kind of issue with the system I want to make sure all parties feel like we take their concerns seriously. Thanks for your time, and sorry for the mixup. I am very appreciative of your thorough and thoughtful response. I do believe it was just an oversight as it seemed unusual for an Ars article. I know that several educators have voiced their interest in using this story to discuss copyright and public/Internet discourse in their own classrooms. So, I am actually quite glad this happened. Thanks. As part of the open graduate course discussed in my last post, I have put out a call for microlectures to be included as a resource on the course wiki. As an experiment in this course, I am attempting to solicit short, five minute or less, recorded microlectures that will benefit the course participants and hopefully, will also benefit those individuals who submit them. The basic request is simply “teach us something” in a style and media format of your choosing (screencasts, talking-heads, lectures, presentations, hands-on, audio, music, animation, drawing, machinima, etc.). While the course is focused on topics related to social media & open education, I also welcome other subjects as I believe it is important that the power of social media is not in simply teaching about social media. If you would like to submit a microlecture, please fill out this Google Form with the appropriate information including a web link to your media. Once submitted, the information will appear in this Google spreadsheet. Thanks to all who consider this request. The course runs from September until early December, so you will have several months to participate. I am hoping that this will become a useful resource for others. I am very fortunate to have been asked to teach a seminar this summer with UBC: Okanagan in Kelowna, BC, as part of their Summer Institute in Education. The seminar runs from July 27 – July 31, and I will have 15 hours in total. I am looking forward to meeting my new students, learning with them, and pushing the possibilities for immersion given such a short time-frame. My goal is to provide much more than a ‘taster’ for social media & open learning, but to help nurture a passion within these learners: to foster genuine interest and active participation through social learning, to nurture critical producers & consumers, and to convey the benefits of media sharing in education & society. I believe that the success of a workshop/seminar/course can only be measured in its effects on learners well after the official experiences are complete. I hope to someday know that this summer experience made a difference for all of those involved. I am currently working on the course wiki (btw: quite enjoying the use of Wetpaint) and I would be happy to receive input from critical readers. Also, if anyone would like to suggest readings or media that could be shared with this group, I invite you use the tag edst499k in your Delicious links. That will automatically add your suggestions to the Readings & Resources page of the wiki. I will be the guest editor of an upcoming issue of in education journal. Please consider submitting an article or feel free to pass on this call to others. To that end, from our current pdf print-based format, we are continuing to evolve the journal and with this forthcoming issue we will move more broadly into and across the digital landscape. However, that does not mean we will disregard the previous work of the journal from the past 15 years, but rather build upon and transcend those discussions, ideas and iterations. As we stated in our initial move to the digital format, the journal will continue to address issues, research and practice in the education of teachers, however we intend to augment the latitude and significance of the notion of education. As a result, we are inviting articles and reviews of works that not only explore ideas in teacher education, but also a broader and more inclusive discussion in education. We envision a discussion that also utilizes the ubiquitous growth of the digital arts and sciences in the everyday practice of living and how that (in)forms both formal and informal education. With this forthcoming issue we are fortunate to have Dr. Alec Couros as guest editor and background coordinator. Dr. Couros will be launching this latest iteration of the journal as we continue and grow the conversation in education. Watch for the journal’s digital space to be launched in November of 2009. To mark this important transition of the journal, a special issue will focus on technology & social media in education. Submitted articles should focus upon current theories, practice, or emerging trends and understandings within the context of teaching & learning, learning environments, or informal learning. – Social and participatory media (e.g., blogs, wikis, microblogging, video sharing) in teaching & learning. – Mobile technologies, txting, or microblogging in learning, or implications for social justice & politics. – Practical or philosophical discussions on open content or open educational resources. – Implications & trends regarding open publishing & academia. – Online communities as formal and/or informal learning environments. – Openness and/or networks in teaching & learning. – Case studies of successful technology integration into learning environments. – Discussions of distance, online, distributed, or flexible learning models in practice. – Changing views & frameworks of knowledge and implications for education. – Social networks, participatory media, and the implications for information & media literacy. – Personal learning networks (PLNs), personal learning environments (PLEs) or related frameworks. – Other topics related to social media, technology, and education. Length: Manuscripts, including references, tables, charts, & media, should range between 10-20 pages (2500-5000 words). As the journal will be primarily web-based, we encourage articles that leverage digital forms of expression and dissemination. Style: For writing and editorial style, follow the Publication Manual of the American Psychological Association (2001, 5th ed.). References should also follow APA style. Review Process: Authors are informed when manuscripts are received. Each manuscript is previewed prior to distribution to appropriate reviewers. Manuscripts are anonymously reviewed. Once all reviews are returned, a decision is made and the author is notified. Manuscripts should consist of original material, and not currently under consideration by other journals. Cover Page (for review purposes): Include title of manuscript, date of submission, author’s name, title, mailing address, business and home phone number, and email address. Please provide a brief biographical sketch and acknowledge if the article was presented as a paper or if it reports a funded research project. Abstract: Please include a 50-100 word abstract that describes the essence of your manuscript. Deadlines: Abstracts should be submitted by July 31, 2009. Once reviewed, if your abstract is approved, you will be asked to submit a completed manuscript by October 1, 2009. For all inquiries or submission information, please contact Dr. Alec Couros via email couros@gmail.com or by phone at (306) 585-4739. Update: The call for this issue is now closed. Thank you to all of those who have contributed abstracts or who have passed this call on to others. It’s entirely possible that there’s a detente to be reached between the copyists and the copyright holders: a set of rules that only try to encompass “culture” and not “industry.” But the only way to bring copyists to the table is to stop insisting that all unauthorized copying is theft and a crime and wrong. People who know that copying is simple, good, and beneficial hear that and assume that you’re either talking nonsense or that you’re talking about someone else. It is unfortunate that current copyright law is more transfixed on control and profit instead of culture and common sense. Read Doctorow’s full article here. I will be leaving to Greece shortly to attend ICICTE in Corfu. The following is an early draft of a paper I wrote for the conference that outlines some of the processes and early feedback I received regarding a graduate course I recently taught, EC&I 831. Comments are welcome and encouraged. Keep in mind that this is an early draft and there are likely many errors. It was a paper written a while ago BEFORE I had much of the new data in (which I am working through right now). I have only shared it at this point as I enjoy making my writing processes as transparent as my teaching. Opensourcecinema.org has released their first Bil C-61 protest video. If you look closely, you can identify me as one of the copyright criminals. Of course, that’s not the important piece here. Protest Bill C-61, stop this betrayal against Canadian citizens before it is too late. 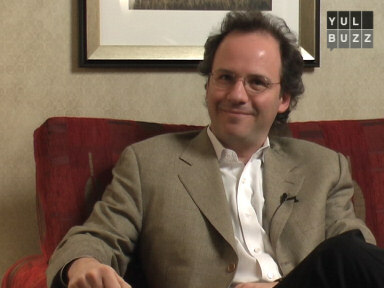 See Michael Geist’s most recent post to find out how. Microsoft has released the new website MyBytes.com to promote copyright education. The site was announced as the company released the results of a survey testing children’s knowledge of copyright law. I agree that there needs to be a greater emphasis in schools on copyright law and understandings of intellectual property. However, in addressing these topics, educators and educational materials MUST include copyleft approaches to addressing “ownership” of intellectual property and materials addressing open content/open source approaches. At an appropriate grade level, I would encourage deconstruction of terms such as “intellectual property” and “ownership” and discuss both practical and philosophical implications of copyleft vs. copyright (and everything in between). The terms need to be questioned and critiqued, and their history and current emphasis in our laws need to be critically explored. – Are these interviews scripted? – Are these interviews censored? – Whose views are being represented here? – Where are the dissenting voices (seeing as M$ has identified that dissent/misunderstandings are the majority)? – Are alternative views of copyright/copyleft represented in these interviews? – Who is the sponsor of this site, and (how) would they benefit from a strict view of copyright? – What is at stake with illegal music downloading? Who stands to lose/benefit? – Are there alternative models for distributing content? Who is using them? Are they successful? – Who benefits from these alternative models? Who loses? – What is the Creative Commons? What is its role? – What are the issues of power and control inherent in these arguments? Educators, please, whatever your views on copyright/copyleft. Be critical, and present both established and alternative views on these issues. Watch this excellent, year-end video from Galacticast which does well to explain some of the basic issues of the proposed DMCA legislation in Canada. The Galacticast netshow has produced a great little end-of-year short calling on Canadians to fight the Canadian DMCA in the coming year. This is the on-again/off-again US-inspired copyright act that Industry Minister Jim Prentice wrote without any input from Canadian interest groups, making it into a kind of wish-list for US-based entertainment giants. The episode parodies many, many science fiction classics (and the host sports a nifty DMZ tee from The Secret Headquarters!) and does a good job of laying out the basic issues in funny, easy-to-understand ways.